This site serves as the main gathering location for collectors of So-Called Dollars, historical US commemorative medals. In addition to offering So-Called Dollars for sale, the site hosts discussions on dozens of So-Called Dollar topics, hundreds of photos, research articles and collector collaboration and communication. After the incredible success of our first book “Discover the World of Charbneau So-Called Dollars” which was awarded the Numismatic Literary Guild Award for, “Best Token and Medal Book, 2012” Bill Hyder and I are ready to release our second book “So-Called Dollars from the Pacific Coast Expositions”. The book will cover all of the so-called dollars associated with expositions held on the west coast and there are dozens of new medals never previously listed. There were eight expositions held on the Pacific Coast. Each chapter consists of two components, a story component and a catalog component. The story component talks about the exciting things that happened at the exposition and the catalog component identifies all of the commemorative so-called dollar medals that were struck for the exposition. Hardbound, 8 ½ x 11, 320 page, full color editions are $59.95. A signed and numbered collector’s leather bound edition, limited to 100 copies, is available for $149.95. An exclusive commemorative medal will be encased in the cover of each collectors leather bound edition. Shipping is $4.50 per book. We don't currently have any events listed that we plan on attending. View all the past and upcoming coin shows and other numismatic events we plan on attending on our events page. The www.So-CalledDollar.com Web Site, the most active site for collectors of So-Called Dollars is currently being redeveloped. This is the first production version and it will take some time to get this new site fully functional. I apologize for the inconvenience this has caused to collectors and researchers who have used this site for the past seven years. I am elated to have a new developer that is actively engaged in the development of my new site and who is also a coin collector, a pretty rare combination. We are working hard together to get this site back up and operational. Please contact me if you have any questions or suggestions. If you are not receiving my fixed price lists and would like to, go to the contact us page and provide your email address. In addition to providing values for so-called dollars from the pacific coast expositions in grades EF-40, AU-50, MS-60, MS-63 and MS-65, the Pocket Price Guide has high quality photos of each type, rarity information and identifies all the various metal compositions they were struck in. There is a check box for each variety with room for notes so collectors can keep track of what they have and what they are looking for. Each year additional so-called dollars will be added to the Pocket Price Guide until all so-called dollars are included. So-called dollars are historical U.S. medals that commemorate a person, place or event in the United States history. They are 33mm to 45mm in size. There are dozens and dozens of medals included in the book that were never before cataloged. Using the 1905 Lewis & Clark exposition as an example, the reference book by Hibler and Kappen originally published in 1963 catalogs four different design types and a total of 14 varieties, considering different metal compositions. The new standard reference for the Lewis & Clark Exposition expands from four design types to 16 different design types and from 14 varieties to 30 different varieties. Collectors interested in medals from the eight expositions held on the Pacific Coast will now have photos and information on medals they probably did not know existed. 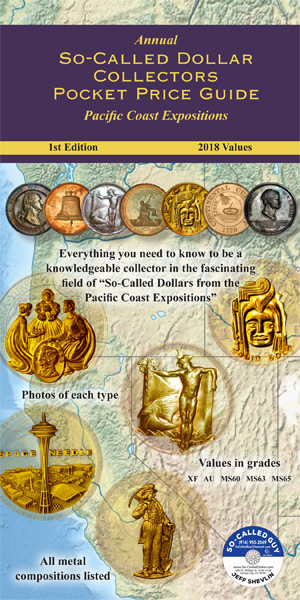 The Pocket Price Guide and soon to be released book “So-Called Dollars from the Pacific Coast Expositions” authored by Jeff Shevlin and Bill Hyder are a collaborative effort involving dozens of collectors that have shared their knowledge and many years of research. 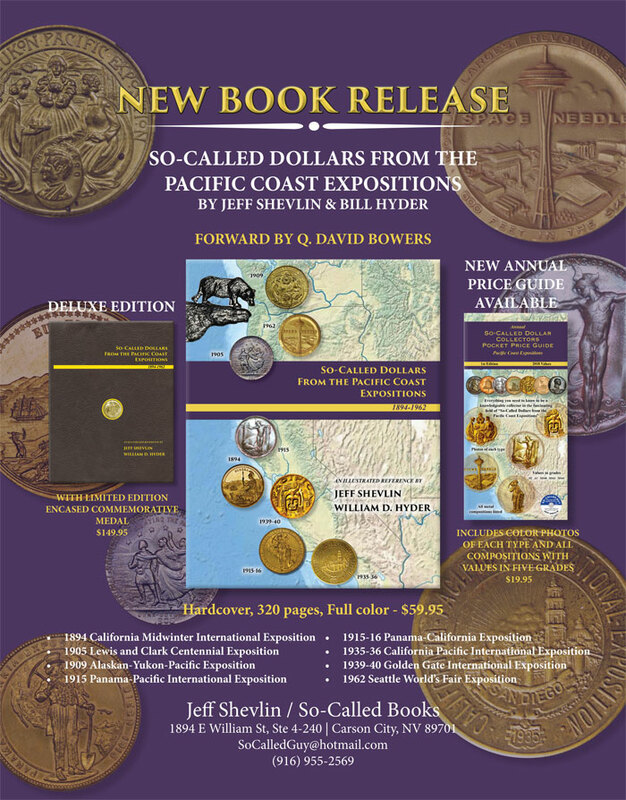 The book tells the fascinating numismatic stories of the eight expositions held on the Pacific Coast and catalogs all of the historically significant so-called dollars struck at those expositions. The so-called dollar market is strong. There are many factors contributing to the surging interest in historical U.S. medals and specifically so-called dollars. The Mega Red Book, which was first published four years ago, has annually included extensive coverage of these historical medals. Mega Red Book IV, which came out in April of this year, has 16 pages devoted to the so-called dollars from the 1919 Panama-Pacific International Exposition. Shevlin has made two appearances on the television show Pawn Stars selling and promoting so-called dollars, he has given dozens of presentations, written dozens of articles as well as written books promoting the numismatic hobby and specifically U.S. historical medals, so-called dollars. Values for so-called dollars fluctuate just as values for U.S. coins fluctuate. Many factors influence their values and the Collectors Pocket Price Guide will be published annually to provide collectors and dealers with valuable pricing information.